Adverse drug events after hospital discharge are common and often serious. These events may result from provider errors or patient misunderstanding. To determine the prevalence of medication reconciliation errors and patient misunderstanding of discharge medications. Patients over 64 years of age admitted with heart failure, acute coronary syndrome or pneumonia and discharged to home. We assessed medication reconciliation accuracy by comparing admission to discharge medication lists and reviewing charts to resolve discrepancies. Medication reconciliation changes that did not appear intentional were classified as suspected provider errors. 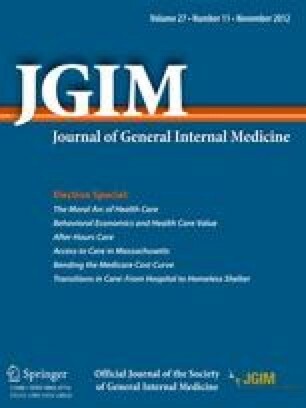 We assessed patient understanding of intended medication changes through post-discharge interviews. Understanding was scored as full, partial or absent. We tested the association of relevance of the medication to the primary diagnosis with medication accuracy and with patient understanding, accounting for patient demographics, medical team and primary diagnosis. A total of 377 patients were enrolled in the study. A total of 565/2534 (22.3 %) of admission medications were redosed or stopped at discharge. Of these, 137 (24.2 %) were classified as suspected provider errors. Excluding suspected errors, patients had no understanding of 142/205 (69.3 %) of redosed medications, 182/223 (81.6 %) of stopped medications, and 493 (62.0 %) of new medications. Altogether, 307 patients (81.4 %) either experienced a provider error, or had no understanding of at least one intended medication change. Providers were significantly more likely to make an error on a medication unrelated to the primary diagnosis than on a medication related to the primary diagnosis (odds ratio (OR) 4.56, 95 % confidence interval (CI) 2.65, 7.85, p < 0.001). Patients were also significantly more likely to misunderstand medication changes unrelated to the primary diagnosis (OR 2.45, 95 % CI 1.68, 3.55), p < 0.001). Medication reconciliation and patient understanding are inadequate in older patients post-discharge. Errors and misunderstandings are particularly common in medications unrelated to the primary diagnosis. Efforts to improve medication reconciliation and patient understanding should not be disease-specific, but should be focused on the whole patient. Dr. Horwitz had full access to all of the data in the study and takes responsibility for the integrity of the data and the accuracy of the data analysis. Study concept and design: Horwitz. Acquisition of data: Ziaeian. Analysis and interpretation of data: Ziaeian, Araujo, Van Ness, Horwitz. Drafting of the manuscript: Ziaeian and Horwitz. Critical revision of the manuscript for important intellectual content: Araujo and Van Ness. Approval of final manuscript for submission: Ziaeian, Araujo, Van Ness, Horwitz. Statistical analysis: Van Ness. Study supervision: Horwitz. The authors would like to acknowledge Amy Browning and the staff of the Center for Outcomes Research and Evaluation Follow Up Center for conducting patient interviews, Mark Abroms and Katherine Herman for patient recruitment and screening, Peter Charpentier for website development, and the other members of the DISCHARGE study team: Ursula Brewster, MD, Christine Chen, MD, Grace Y. Jenq, MD, Sandhya Kanade, MD, Harlan M. Krumholz, MD, and John P. Moriarty, MD. At the time this study was conducted, Dr. Horwitz was supported by the CTSA Grant UL1 RR024139 and KL2 RR024138 from the National Center for Advancing Translational Sciences (NCATS), a component of the National Institutes of Health (NIH), and NIH roadmap for Medical Research, and was a Centers of Excellence Scholar in Geriatric Medicine by The John A. Hartford Foundation and the American Federation for Aging Research. Dr. Horwitz is now supported by the National Institute on Aging (K08 AG038336) and by the American Federation for Aging Research through the Paul B. Beeson Career Development Award Program. This work was also supported by a grant from the Claude D. Pepper Older Americans Independence Center at Yale University School of Medicine (P30AG021342 NIH/NIA). An earlier version of this work was presented as a poster at the American College of Cardiology 60th Annual Meeting in New Orleans, LA in April, 2011.